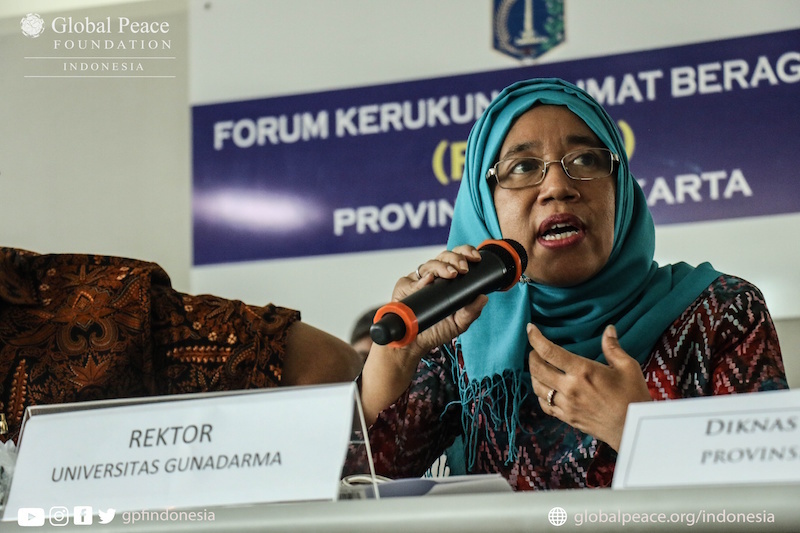 Global Peace Foundation (GPF) Indonesia convened religious leaders, government officials and local professionals from all sectors of society in a forum for “Pancasila: Vision in Action” on September 26 in cooperation with the Inter-religious Harmony Forum (FKUB) of Jakarta. The forum took place at the Graha Mental Spiritual Central Jakarta, sparking a grassroots campaign to revitalize the spirit of Pancasila in Indonesia. Participants gathered to discuss appropriate steps to implement the values ​​of Pancasila into daily life for a strong, moral and innovative society. Indonesia is a home of diversity; different religions, beliefs and practices are able to live peaceably in what has long been considered a model of “Unity in Diversity.” Pancasila, the founding philosophy of the Indonesian state has played an important role in this “unity in diversity” with an emphasis on spiritual principles and the importance of shared values to hold together a diverse people based on love, respect, and care. Pancasila, meaning “five principles,” are tenants of Indonesian’s liberal democracy, including a belief in one God, a just and civilized humanity, the unity of Indonesia, democracy supported by unanimity of representatives, and social justice for all people within Indonesia. 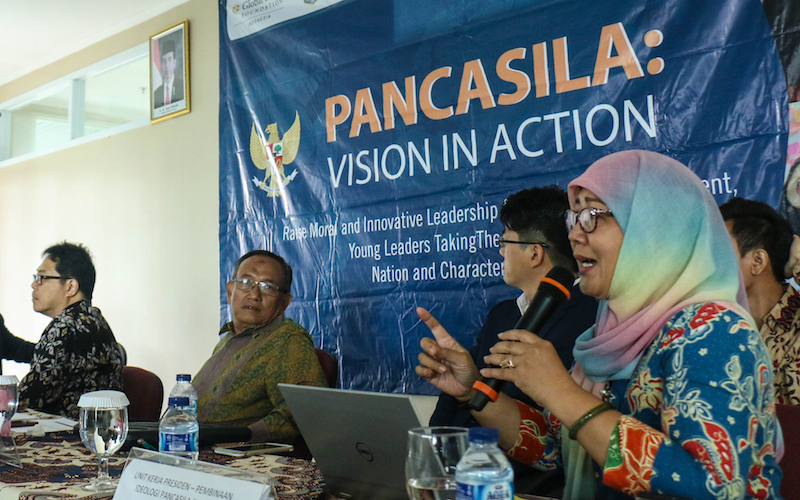 The Pancasila Vision in Action forum explored practical steps in implementing the values of Pancasila in daily life, conveying the importance of interfaith cooperation and the essential role of citizens in making the vision a reality through participation in civil society. Participants discussed a new paradigm of interfaith relationship to bring unity and peace, a society in which we are all part of one family. Ultimately, we aspire to build on this understanding to realize the mission of improving the quality of life and intercultural harmony in our families, communities and Indonesia as a whole. More than ever today, we are faced by global crises to which Pancasila and the practice of Pancasila in everyday life can be the practical solution. In order to do so, we must work to strengthen our understanding of Pancasila and learn new ways to manifest its principles in our families and communities. Mr. Ahmad Syafii Mufid, Chairman of FKUB Jakarta spoke on the importance of collaboration to build peace and to create religious harmony and harmony in greater society, noting that Pancasila is not only a model for Indonesia, but for all the world. FKUB DKI Jakarta, in cooperation with Global Peace Foundation (GPF) Indonesia, works to promote peace and Pancasila globally. This forum was a first step in a long-term plan to promote Pancasila in Indonesia as a model for peace and national transformation. Dr. Chandra Setiawan, MM, Ph.D (Chairman of the GPF Indonesia Board) commented that Pancasila is very important in Indonesian society. Its principles played an important role in bringing to reality the concept of a sharing economy, which is now rapidly growing in Indonesia and beyond. He lamented that Pancasila is often only thought of as a textbook concept, and put forward the current challenge as one to implement the principles in our daily lives. Pancasila is relevant not only to Indonesia, but also the entire world. Mr. Jinsoo Kim (Regional Director of GPF Asia Pacific) expressed the importance of Pancasila in a world that is currently full of conflict, encouraging participants of the forum to find pathways to make Indonesian Pancasila even more popular than Korean Pop (K-Pop) and become the lived lifestyle of the young generation today. But getting youth interested in the rich depth of Pancasila is not a simple matter. Ms. Tamami Jeon (Senior Researcher & Analyst, Global Peace Foundation) suggested that one way to introduce Pancasila to the young generation is to showcase the best practices of the local community groups to inspire others towards the same goal. Pancasila can be more interpreted for the present generation (millennial generation) through developing a common vision, shared values and a coordinated plan of action. Eddy Aqdhiwijaya from The Compassionate Islam Movement called youth the “silent majority” who lack an exemplary figure that embodies the principles of Pancasila. He suggested promoting Pancasila content through social media, in the spaces that most millennials are involved in. With 132 million Internet users, he expressed that there was a lot of potential promoting Pancasila principles to the younger generation. Pancasila today is very different from the New Order era (Suharto Regime). Mr. Sudarto of the Setara Institute expressed the trauma experienced by those of the New Order generation who were indoctrinated with the principles of Pancasila without discussion and only in theory. He pointed to the fact that only the Abrahamic religions, among a few others, are recognized and given legal status and funding. He raised concerns about native Indonesian religions such as Sunda Wiwitan and discrimination against native religious groups, which has limited collaboration up until now. Addressing these issues, other forum speakers including Mr. Taufan Bakri (Kesbangpol DKI Jakarta) and Mr. Siswo (PUSAD Paramadina) pointed to the administrative challenges of legalizing religious groups and the importance of cooperation from the public through forums like this one. 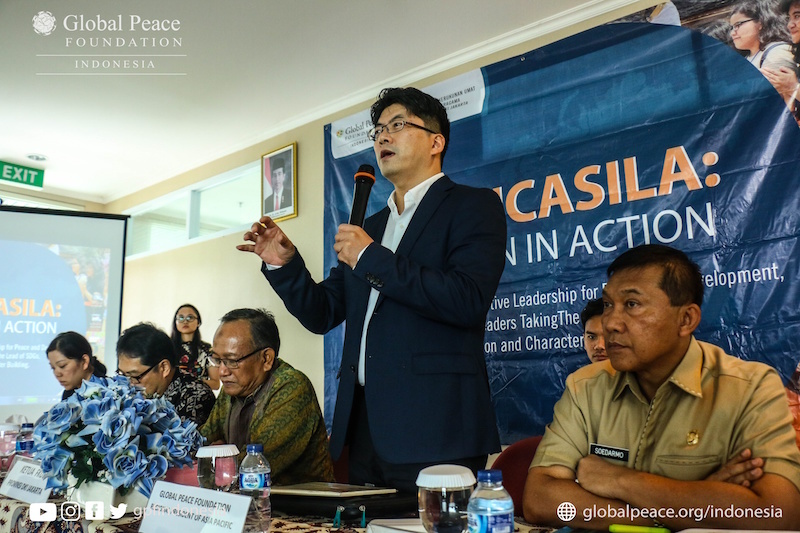 Father Antonius Suyadi (Jakarta Archdiocese) encouraged participants to think of Pancasila as a house for all people, a place where all are tied together with the five principles, to dialogue issues and concerns. In order to achieve this in Indonesian society, he felt that Pancasila must be able to accommodate changes and uphold good values in order to be useful for developing peace in Indonesia. Learn more about How We Work: Pancasila and subscribe for monthly newsletters.